Here you can find any and all information related to Maple Films. Check out some of our previous works, get updated on current and future projects, or maybe even glance over our lovely video and image galleries. 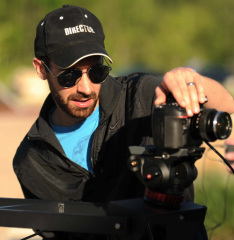 Ever since his mother gave him his first video camera at the age of 14, Dustin has been passionate about filmmaking. He has directed, shot and edited several award-winning short films over the years, most of which can be found on this website! Since indie filmmaking rarely pays the bills, Dustin spends his work week creating videos for Kent State University's Communications & Marketing department. He is always looking for a new story to share with audiences. His favorite films include Star Wars, Lord of the Rings, Back to the Future, ET, and The Curious Case of Benjamin Button. A veteran of two Iraq tours and hundreds of short length productions (only two of which being cat videos), Jon is the team’s critical eye and often-tapped editor. He brings a deep interest in photography, a fondness for cinematography, and over a decade of video editing experience. His favorite films are the Back to the Future Trilogy, the original Star Wars Trilogy, Moon and Children of Men. Although it only says Writer/Producer next to his name, Terry is in fact a Swiss Army Knife of film talent. He has directed, scored, edited, designed sound effects, ran camera, and even acted...sometimes all in one film production! To put it simply, there is nothing that Terry cannot do. His favorite films include Ghostbusters, Star Wars, and pretty much anything by Wes Anderson.